Welcome to the Eighth Annual Graduate Student Symposium at the University of Northern Iowa coordinated When the Symposium first started in 2008, it was two hours long and held in the Great Reading Room at UNI. The Symposium has grown over the years from a small gathering of students and faculty to an all--day event complete with oral presentations, poster presentations, and creative performances. This event showcases the depth, breadth, and quality of graduate student's research, scholarship, and creativity at the University of Northern Iowa. Today we celebrate the various types of research and creativity activity done within the graduate programs we offer at UNI. You will see presentations from fields as diverse as biology, creative writing, education, history, music psychology, public policy, and technology. Even within these multiple fields, the similarities become obvious as you see students addressing topics that move across traditional disciplines, making a difference in the lives of people of Iowa and across the nation. 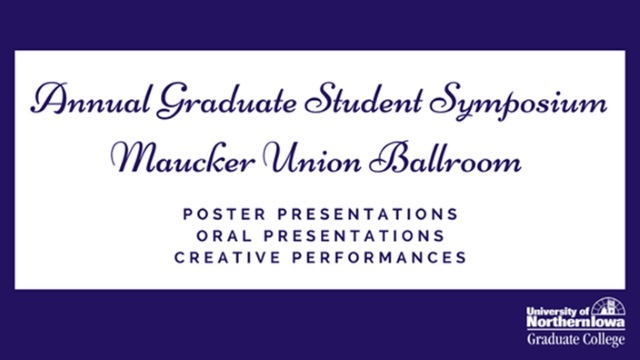 The Annual Graduate Student Symposium is coordinated by the Graduate College. Full Symposium Program (pdf) The official program distributed by the Graduate College in pdf format.